Top 5 Family Friendly Coastlines we've discovered across Europe! Roadschooling our children each week has allowed us to seek out new travel/education or adventure opportunities across Europe. Now, everyday brings a new outdoor classroom / playground / family adventure for us to discover together as a family. 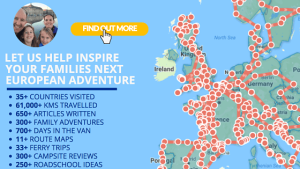 So if you're considering planning your own road trip or just an extended family holiday, we hope it gives offers ideas for family fun across Europe. Share in our adventure by finding out more below. Motorhoming in Norway | Geirangerfjord …. deservedly a UNESCO site!!! Flamsbana Train up, Mountain bike down…. a family approach to seeing Flam at its finest! Motorhoming in Norway | Is there a better way to see a Fjord with kids? Tested our Inner Monkeys on the Voss Active High Ropes course! Considering Family Motorhoming In France : Just Don’t Miss Out On the ‘Les Alicourts Resort’ in the Loire Valley! Top 5 Family Friendly Coastlines we’ve discovered across Europe! © [Richard Thorley] and [LifeinourVan] [2014-18]. Unauthorized use and/or duplication of this material without express and written permission from this blog’s author and/or owner is strictly prohibited. Excerpts, photographs and links may only be used, provided that full and clear credit is given to [Richard Thorley] and [LifeinourVan] with appropriate and specific direction to the original content. Visiting Budapest with Your Kids.... They'll be Amazed Like Ours Were! Join us? Get regular updates and giveaways straight to your inbox!